QUEBEC – Yorbeau Resources of Montreal says the updated resource estimate at its Scott copper-zinc-gold-silver property near Chibougamau has tripled since an earlier estimate was compiled in 2011. The new 43-101 report was prepared by Roscoe Postle Associates. The current numbers are 3.6 million indicated tonnes grading 0.9% copper, 4.2% zinc, 0.2 g/t gold and 37.0 g/t silver plus 14.0 million inferred tonnes at 0.8% copper, 3.5% zinc, 0.2 g/t gold and 22.0 g/t silver. 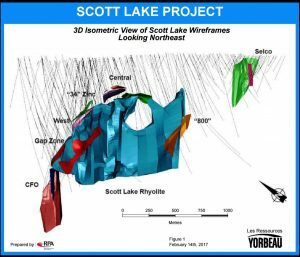 The increase is due to the 2015 discovery and inclusion of the Gap lens, inclusion of the historical Selco lens, additional drilling in 2012 at the Scott Lake stringer sulphide zone and West lens. The exchange rate between the Canadian and US dollars was also adjusted. View of Scott Lake wireframes looking northeast. The updated resource includes mineralization in several volcanogenic massive sulphide lenses and stringer zones located over a strike length of 2.0 km. Individual lenses range in depth from the Selco lens on the surface to about 1,000 metres below the surface. They have a generally westerly plunge. More information about the Scott property and Yorbeau’s other projects is posted at www.YorbeauResources.com.